According to recent data released by the Center for Disease Control and Prevention’s National Center for Health Statistics, the preterm birth rate in the U.S. rose in 2017. This is the third year in a row with an increase. In 2015, the rate increased to 9.63 percent, in 2016 to 9.85 percent, and in 2017 to 9.93 percent. This is a very alarming trend. The data also shows great disparities among racial and ethnic groups. The most significant increase in the preterm birth rate was seen among non-Hispanic black women and Hispanic women, while the rate among non-Hispanic white women was essentially unchanged. Babies who are born too soon may face more health problems or need to stay in the hospital longer than babies born on time. Some of these babies also have long-term health effects, like problems that affect the brain, lungs, hearing or vision. These problems are affecting more babies whose moms are black or Hispanic. 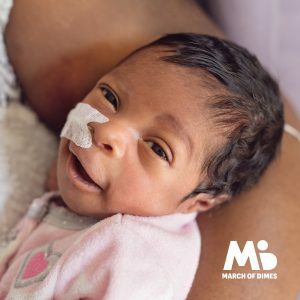 At March of Dimes, we recognize an urgent need for new solutions to address the serious problems of premature birth. We are working hard to help close the racial and ethnic gaps in preterm birth rates and achieve equity in birth outcomes. We won’t stop advocating, searching for answers or supporting all moms and babies. All babies deserve the best possible start in life and the opportunity to thrive and be healthy.